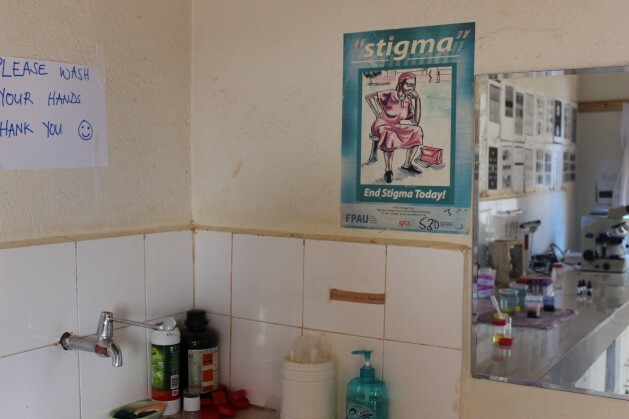 A poster about stigma in a HIV testing lab in Uganda. Credit: Lyndal Rowlands / IPS. UNITED NATIONS, Dec 1 2016 (IPS) - Eighteen million people, just slightly under half of the people living with HIV and AIDS globally, are now taking life-saving medication, but global efforts to end the disease still largely depend on prevention. While efforts to expand antiretroviral treatment have been relatively successfully, prevention efforts have been more mixed. With the help of treatment, mother to baby transmission has dropped significantly. Transmission between adults aged 30 and over has also dropped. However, transmission rates among adolescents have risen, causing concern, particularly about the high number of new cases among young women between the ages of 15 to 24. Ensuring the continued and renewed domestic and international funding for both treatment and prevention was the subject of discussion at the Center for Global Development in Washington D.C. on Monday. The event, held ahead of World AIDS Day on 1 December, focused on a U.S. government initiative aimed at involving government finance departments, as well as health departments, in the HIV response. Currently over 55 percent of the HIV response in low and middle-income countries comes from the governments of low and middle income countries. However a significant amount of international support, roughly one third overall funding, comes from the U.S. government, which has made tackling HIV and AIDS a priority through the President’s Emergency Plan for AIDS Relief (PEPFAR). However while U.S. funding for the HIV and AIDS response is considered bipartisan HIV and AIDS support, like any U.S. government program may change under Presidency of Donald Trump. Of the 18 million people currently on antiretroviral treatment globally, “4.5 million are receiving direct support,” from the U.S. while an additional 3.2 million are receiving indirect support through partner countries. While there remains broad consensus over treatment, prevention efforts are considered more politically contentious. Previous Republican administrations have supported abstinence programs, which studies have shown to be ineffective at preventing HIV transmission. However she noted one positive example from incoming Vice-President Mike Pence’s home state of Indiana. “(Pence) actually eliminated (needle exchange) programs and then saw HIV / AIDS go up and so he reversed his position, so I think that sounds good, he listens to evidence and action,” said Glassman. However Pence’s record on women’s reproductive rights and his reported comments that in 2002 that condoms are too “modern” and “liberal”, may not bode well for overall prevention efforts, especially considering that addressing higher transmission rates among adolescent girls also requires addressing gender inequality and sexual violence. Update: In 2000, Pence’s campaign website also said that a US government HIV/AIDS program should direct resources “toward those institutions which provide assistance to those seeking to change their sexual behavior,” a statement many have interpreted as support for gay-conversion therapy. Reducing the high rates of transmission among adolescent girls will not be easy. It involves increasing girls economic independence as well as helping them to stay in school longer. “It’s a discussion of investment in secondary school … so the discussion is bigger than health,” said U.S. Global AIDS Coordinator, Deborah Birx at the event. This is one of the reasons why involving government finance departments is important. However finding additional funds for both education and health in the “hardest hit countries” will not be easy, said Glassman.